Why choose me as your Notary Public? 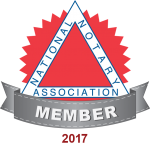 As your local traveling Notary…. I treat my clients with courtesy and integrity. I provide prompt and professional service for attorneys and law offices, banks, commercial and residential lenders, county jails, escrow companies, local businesses without a notary on staff, mortgage brokers, realtors, senior living facilities, hospitals, nursing homes and the general public. Convenient appointments can be scheduled and last minute calls are always welcome. If you are seeking high quality, reliable mobile notary services, please call today @ 916-800-1006. Services outside the coverage area above are available for additional surcharge. Please Call or Email Today! Disclaimer – I am not an attorney and therefore, by law, cannot explain or interpret the contents of any document for you. I also cannot instruct on how to complete a document or direct you on the advisability of signing a particular document. Before I arrive make sure you have read all documents and understand them all. I get paid for services whether you sign or not. So make sure you have read everything. I will not charge for notarization only my service fee, if you change your mind in signing after I get there you are still liable for my time and travel.